Traditional performance management tools only focus on financial outcomes and often fail to consider other important factors like loyal customers or skilled staff. A more balanced approach is to consider non-financial performance measures in relation to Company Strategy. For example, customers might be prepared to pay more for goods and services produced from an environmentally friendly company. A Balanced Scorecard (Kaplan and Norton, 1992) gives equal weight to four different perspectives. In a single diagram you can record key financial and non-financial goals, with links to meaningful benchmarks and performance measures. The Scorecard acts as a communication and measurement tool to address strategic planning. Create a new Package called 'Balanced Scorecard'. 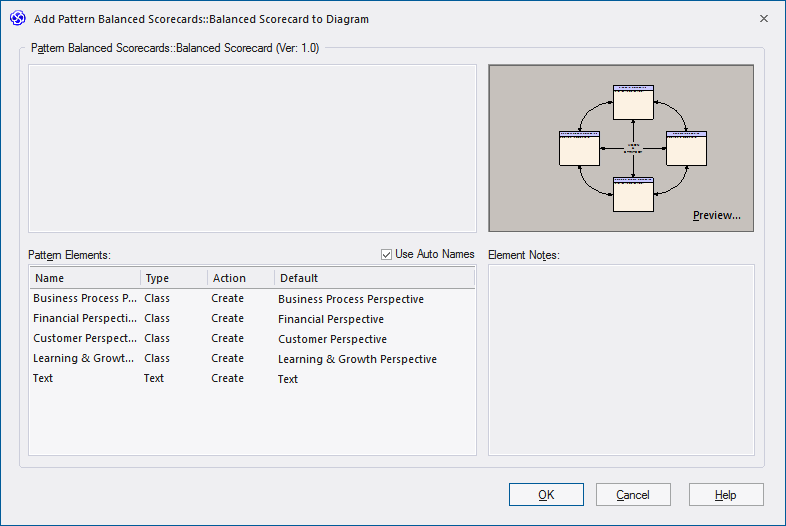 Right-click on the Balanced Scorecard Package and select 'Add Diagram'. Create a new Balanced Scorecard diagram called 'Four Perspectives' and click on the OK button. 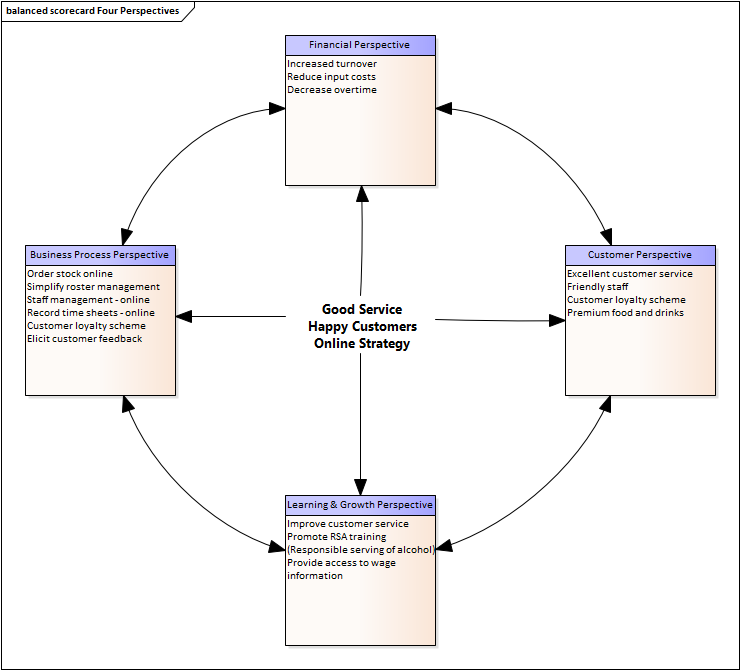 Select the Balanced Scorecard Pattern from the Toolbox and place it on the Diagram View. This diagram illustrates how the company vision and strategy is directly tied to each of the four perspectives. Resource allocation is based on results and strategy rather than a set of arbitrary financial numbers from the previous financial year. The Balanced Scorecard approach helps to ensure that business activity is engineered to adhere to company values and meet targets. Enterprise Architect allows each perspective to be linked to supporting documentation, model information and rigorous benchmarks that verify whether strategic initiatives have been undertaken and associated targets met.